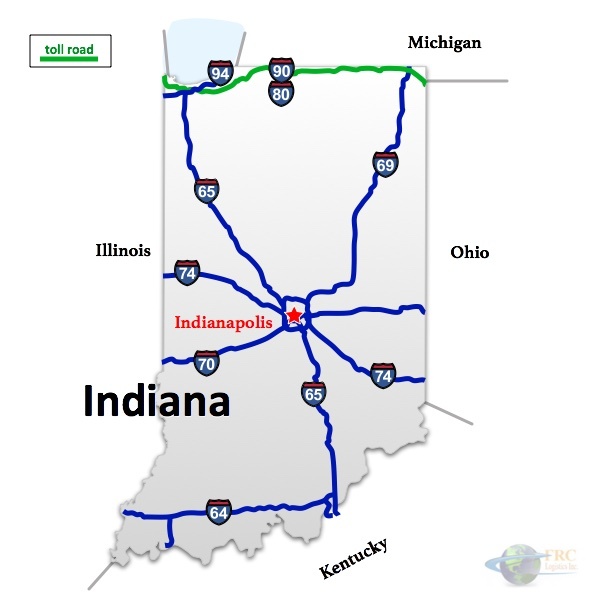 Indiana to North Carolina Freight shipping and trucking services are in high demand; Indianapolis to Greensboro is a very heavily traveled route. The Indianapolis, IN to Greensboro, NC shipping lane is a 555 mile trip that takes more than 9 hours of driving to complete. Shipping from Indiana to North Carolina ranges from a minimum of 365 miles and over 6 hours on the road from Rockport, IN to Murphy, NC, to over 993 miles and a minimum of 15 hours on the road from Hammond, IN to Shallotte, NC. The shortest route from Indiana to North Carolina is along the US-35 E; however, there’s also a more westerly route that uses the I-65 S, passing through Louisville, KY instead of Dayton, OH. FRC logistics works with North Carolina trucking companies and carriers all over the US to bring our customers freight shipping rates as much as 75% below direct quotes from carriers. We serve trucking companies by professionally representing businesses and individuals who require freight shipping. We serve our clients by managing every aspect of the shipping process, thereby minimizing cost and risk to both deadlines and budgets. 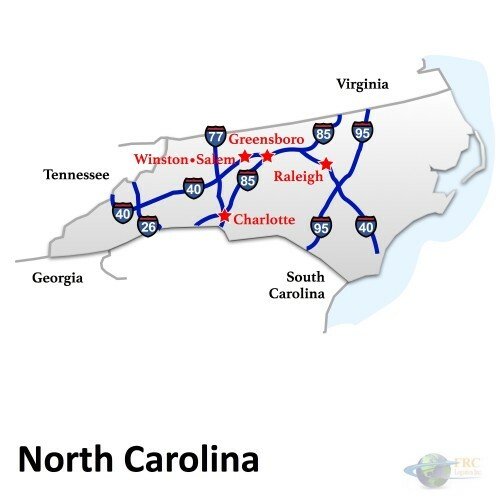 North Carolina offers plenty of dry van, flatbed and specialized carriers, and FRC Logistics specializes in connecting each client with the best trucking company for their shipping needs. From Conestoga trailers to refrigerated dry vans to extendable flatbed stretch trailers, our carriers have the equipment needed to meet pretty much every need. North Carolina’s economy is strong in both farming and manufacturing, and the state has been expanding its knowledge economy in past decades, as well. North Carolina farmers grow tobacco, sweet potatoes and soy beans, and raise livestock as well. North Carolina manufacturers produce textiles, paper and furniture, and NC has a growing chemical and electronics sector. All of these industries, concentrated in the cities and scattered throughout the countryside, require freight shipping. FRC can provide the specialized solutions required by North Carolina industry and agriculture. Indiana to North Carolina Freight shipping quotes and trucking rates vary at times due to the individual states industry needs. Since Indiana is mostly industrial, and North Carolina is mainly agricultural, with many food processing and distribution centers, we see plenty of shipments by refrigerated trailer. We also see a number of flatbed shipments as well as by the more common dry van trucks. Our Less Than Truckload (LTL) carriers in both Indiana and North Carolina are also running a number of regular services between the two states, and it’s an active route for heavy haul freight shipments, as well.